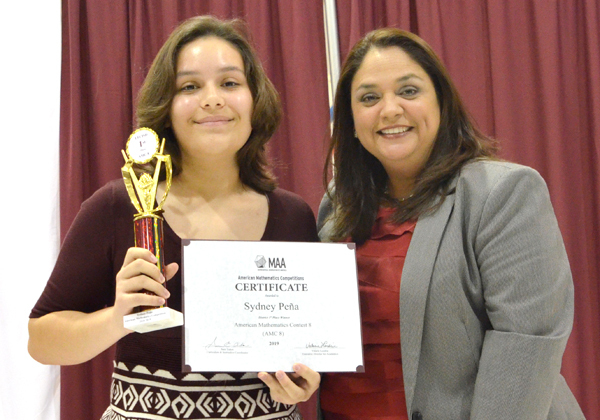 Sydney Jo Peña of Liberty Memorial Middle School took top honors in the District’s American Mathematics Competition for students in grades 6-8. Awards were presented Wednesday in the Liberty Memorial Middle School Gymnasium. The contest was open to students in grades 6-8 who received recommendations to compete from their teachers, counselors and/or administrators. AMC is the longest-running and most prestigious math contest in the United States. AMC-8 provides students with opportunities that foster the development of positive attitudes towards mathematics and positive perceptions of themselves as learners of mathematics. Certificates were presented to all students from the district’s three middle schools who took part in the competition. The award was the second for Peña in five days. She finished in first place in the Los Fresnos CISD Spelling Bee held Jan. 26. Ninety students from the three middle schools competed.